Cambridge Audio CXC review | What Hi-Fi? The Cambridge CXC is a real sign of the times in the world of hi-fi. 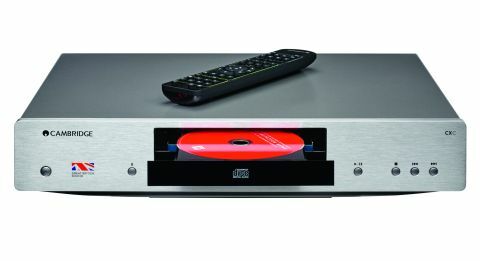 A CD transport, rather than a CD player, this unit does the vital work of reading the information held on a compact disc, but doesn’t waste its effort in turning that digital signal into an analogue output. As with many pieces of stand-alone hi-fi, the theory goes that using separate pieces of kit to do individual jobs will almost always provide a superior sound. This, it seems, is the case with the Cambridge CXC. First things first, though. The CXC is a nicely made piece of equipment, its machined-metal chassis feeling every penny of the £300 you’ll pay for it. It is built, not unreasonably, to match the rest of Cambridge’s impressive CX range, including the CXN streamer and two integrated stereo amplifiers, the CXA60 and the CXA80. As well as looking good, the CXC has some decent components in it, including the single-speed transport and proprietary S3 Servo that it shares with the Cambridge Audio Azur 851C (£1200). In many ways this is a positive, but it does mean that the CXC is restricted to doing one thing: reading CDs – no SACDs or MP3 CDs here. Happily, it does that one thing very well. At the rear are ports to connect the transport to other members of the CX family, and two digital outputs – one S/PDIF coaxial, and a Toslink optical digital. You can use this transport, then, with any DAC that you might already own. After a couple of days’ running in, we match the CXC with the Award-winning Arcam irDac (£400) – and they make a quite formidable pairing. Listening to a CD of The Dark Knight OST we are immediately impressed with the precision of the sound the pair provide. Crisp, precise treble is married to a snappy, well-defined bassline that really drives the music along. There’s a real musicality to the piece that can get lost on lesser players, with organic, fluid interplay between instruments. We’re so impressed that we look to our £1000 reference Naim CD5Si CD player to make a comparison. The Naim just trumps the CXC/irDAC combination for outright musicality, but there’s a decent price hike between the two as well. As a contrast, we also measure the combo against the Award-winning Marantz CD6005 (£300). This is a CD player with its own DAC on board, so you would expect the CXC and Arcam pair to outdo it, but the improvement in sound of the separates pairing over the all-in-one player is immediately obvious. Timing and the interplay between instruments are better, more organic, more fluid, more expressive. And the Marantz, remember, is a rather brilliant £300 CD player. Does that mean we’d take the Cambridge over the Marantz? Not necessarily. The two units are similarly priced, but the Cambridge CXC is useless without a DAC to marry to it. And that’s where our comment about it being a modern product for a new hi-fi world comes in. The once humble digital to analogue converter is becoming a ubiquitous and increasingly vital hi-fi component. And if you’ve already got a good DAC, we would not hesitate to recommend the Cambridge CXC over a standalone CD player to link to it. You’ll have to spend a good deal more than £300 to match the sound quality it offers.